Iron Maiden and Metallica are to co-headline Sonisphere at Knebworth Park on 4-6 July 2014. The huge shows at will be the only UK appearance for both bands, and marks the return of Sonisphere after the festival took 2013 off. "We all grew up in England well aware of the importance of the legendary concerts at Knebworth, and scarily it all seems quite recent!" says Iron Maiden frontman Bruce Dickinson. "Without being clichéd, it really is an honor and privilege to return to play there with the purpose of celebrating some of the finest moments in British rock history from inspirational bands like Pink Floyd, The Who, Zeppelin, The Stones and Genesis." "This will be the last concert of our 'Maiden England' Tour and it is very fitting to end a long and hugely enjoyable tour in our own back yard. We have tweaked the 'Maiden England' set list a bit to make it more representative of our whole 80s era and to give the fans something a bit different, especially as this will be the last of our three tours with an historical perspective. "If you are there on the day it is highly likely that you will hear some of these songs played live for the very last time ever. So on an occasion like this, a celebration and the end of a chapter, you can be sure we will do our utmost to give our fans one hell of a show and go out with all guns blazing." Metallica will be delivering a 'Metallica By Request' interactive setlist spanning the band's entire career. Fans that purchase tickets online will be able to vote for the 17 songs they would like to see the band perform, with Metallica choosing the 18th number. "This just works on all fronts: Metallica and Knebworth, Metallica by Request, Metallica and Iron Maiden," says Metallica drummer Lars Ulrich. "To be invited to co-headline the 40th anniversary celebration at the legendary Knebworth House is truly a mindf**k.
"Considering the iconic bands whose performances at Knebworth are part of rock and roll history, it's not only a next level honor, but a somewhat humbling undertaking. And what could be more fitting on our third Knebworth go-around than to play an all-request set, chosen entirely by the fans? "We are soooo excited about the limitless possibilities of our friends picking what songs Metallica get to perform on this forthcoming evening from the nearly 140 songs we've recorded throughout our ride. "Who knows what crazy challenges will be thrown our way? Maybe a song that has never been performed live before? Maybe a few deep cuts that haven't been aired in ages? Maybe a couple of your toe-tapping favorites? An obscure cover? Whatever happens, it will be unique, it will be special, and it's all up to you. "Add the cherry on top…co-headlining with Iron Maiden, who are a big reason that Metallica exists in the first place. Although we haven't played together on the same day since 1988, this is the closest we've come for 25 years, and for all our fans who share the same love for Iron Maiden as we, the band members do, this will hopefully amount to what many rock fans would consider a dream bill." For ticketing information visit the official Sonisphere website. 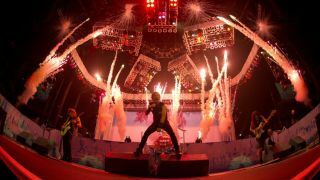 Find out more about Metallica By Request at the official Metallica website, and find out about Iron Maiden's Maiden England tour at the official Iron Maiden website.